The holidays are a fun time of year, but many people stress about what gifts to give their loved ones. Instead of the typical pair of socks or a new sweater, you can give the gift of teeth whitening in Canton! This easy and affordable service will give you and your loved ones a dazzling smile for the holiday season. Read on to learn the many benefits of teeth whitening, and why it’s a great gift to give around this time of year. Teeth whitening has become the most popular cosmetic service by far because of it’s fast and dramatic results. As you grow older, your teeth begin to lose their pearly white shade because of reasons like routine wine or coffee drinking, smoking, or plain-old aging. 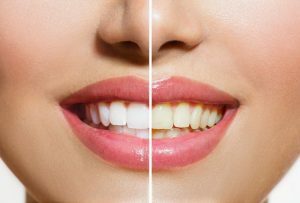 Teeth whitening can eliminate stains and discoloration from your smile to give you a beautiful set of pearly whites. This service is especially popular around this time of year because of all of the holiday gatherings and photo opportunities. Have you tried over-the-counter whitening products that don’t give you your desired results? That’s because they aren’t using professional-grade whitening gel. In just one easy visit to the dentist’s office, you can leave with a smile that is up to 8 shades whiter. Do you want the strength of professional whitening in the convenience of your own home? Your dentist provides an at-home option that is custom-made for you. Over-the-counter whitening kits use whitening trays that are one size fits all. Your dentist’s at-home whitening kit features whitening trays that are customized to fit your smile perfectly. This gives you the best results in the most comfortable way possible. Did you know your smile is the second thing that people notice about you? Additionally, those with whiter smiles are perceived as younger, more successful, more confident, and healthier. Teeth whitening can open doors in your professional and social lives. It’s amazing what a beautiful set of pearly whites can do! Do you want your smile to have some extra dazzle this holiday season? Looks like it’s time to put teeth whitening on your wish list. Or, if you know that your family has a holiday card coming up, you can give the gift of teeth whitening to your loved ones. That way, you’re all ready when the cameras start flashing. Dr. J. D. Robison is a Michigan native who loves caring for the patients in his community. He takes pride in offering cosmetic services like teeth whitening that beautify smiles and boost confidence. He offers in-office and at-home whitening treatment to make sure you can brighten your smile in the most comfortable way for you. He currently runs his own practice, and he can be contacted through is website or by phone at (734) 453-6320 for any questions you may have.